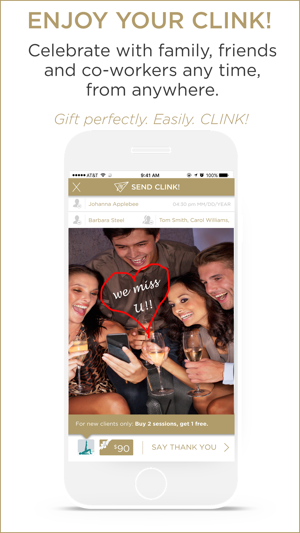 If time challenges, or distance, keep you from celebrating events with family, friends or co-workers then CLINK!Gift is your mobile solution. Never miss an opportunity to acknowledge and connect with the important people in your life. Send Gifts, Send Money, Send LOVE!! How to Create a CLINK! Take a photo and customize it using filters and text to create a unique and personal message. Having a bad hair day, choose a pre-made gift card instead. 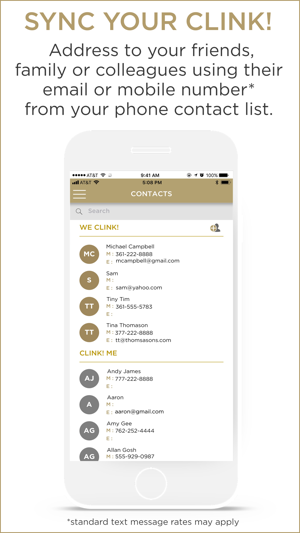 Use your phone contacts to address your CLINK! and send it to anyone using their email or phone number (standard text messaging rates apply). Add a dollar amount to your CLINK!. The recipient can redeem the gift value with the merchant you suggest for goods and services, or cash out to a preferred account: bank/debit/credit card. Select from a list of connected Redeem Partners that accept CLINK!s at their location or on their website. 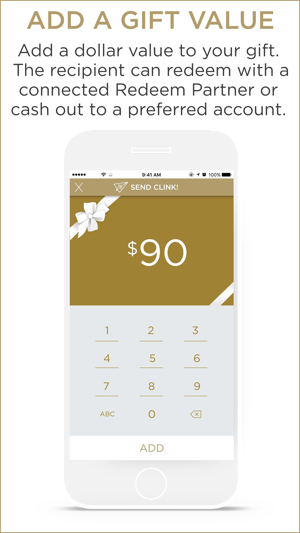 The recipient can pay for goods or services with their CLINK!. Or, browse a list of our suggested merchants for gift ideas. CLINK!Tip: Use a picture from your camera roll to show what or where to spend the money you sent. When you receive a CLINK! — tap the gift box, confirm total amount to spend and present to a pre-approved Redeem Partner. Prefer to spend the money somewhere else? Cash out to the account you set up in your account profile. You decide how to ENJOY your CLINK!Gift. One of the unique features of CLINK!Gift is Group Gifting: You can create a CLINK! and invite others to join in the fun. If they add a gift value to the CLINK! they create, the total gift value is aggregated and presented to the recipient. All CLINK!s tagged to the original CLINK! are viewable as a group so you can view all CLINK!s sent. Group DONATE! and get your friends working together for your favorite charity. Add likes, comments and emojis to all of your contact's CLINK!s. View all gifts that are tagged together in a group. Say Thank You to those who send you a CLINK!Gift by sending back a CLINK! CLINK!Gift is a fundraising tool that connects your members and their network to your organization, extending your reach and raising awareness for your mission and programs; and raising funds through donations and custom campaigns. In app advertising, custom campaigns and private label opportunities are available. Gift Only gives the recipient the option to use the gift value with any merchant in our marketplace. Perfect way to be there when your not there and you want to make it count!!! Out of town for my friends birthday but able to be part of the party through Clink. Thanks Clink! I want to give a good friend a spa day, but didn’t know where. CLINK!Gift was the perfect option. Thank you!